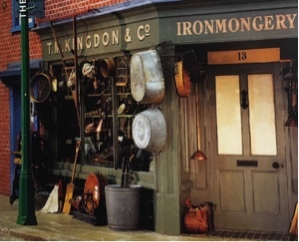 I took this photograph of the ironmongery store at Milestones a couple of years ago. The other day I thought I’d make a large painting based on on some of the many interesting things displayed there. So yesterday my young friend and I took a trip to Basingstoke to have another look and to take a number of really sharp photographs of the store and possibly to make sketches of some of the more interesting items. 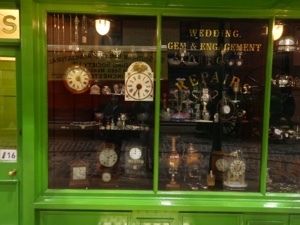 But although the store was still there all the lovely things hanging on the outside were missing! It seems it will be back as it was in a few weeks - so we’ll have to go back sometime. 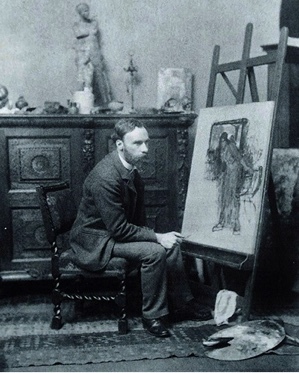 (I want to include a few surprises in the painting). It’s still great to walk around Milestones. It’s a really special place. Most of the buildings are based on real ones. 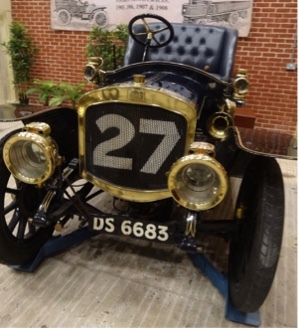 For several years the curator’s team collected and stored an amazing variety of materials. 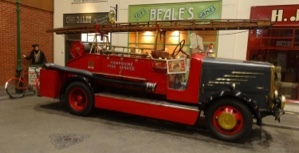 These included roofing slates, granite setts, wooden flooring blocks and myriad items of street furniture such as lamp posts, pillar boxes and railings. The result is a network of Victorian and 1930’s streets, complete with shops, factories and houses. 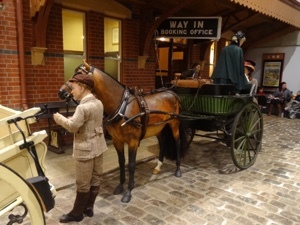 There are over 20,000 objects ranging from gigantic steam engines to pen nibs. There’s also a second World War ‘Make and Mend’ display. 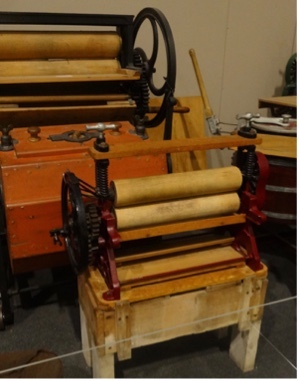 And in the section showing household items through the ages we came across a number of mangles - which reminded me of wartime days when I was a boy because it was my job to put the wet clothes through it as I pushed the handle. 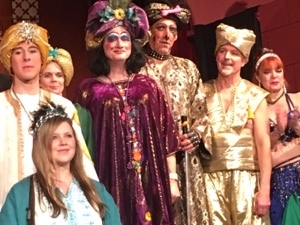 Last week we went to the pantomime by the Wargrave Theatre Workshop at the Woodcliffe Hall. What a rollicking affair it was. 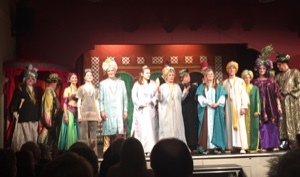 They were performing Ali Baba and the Forty Thieves. Great costumes as well. All the men had curled up Arabian shoes. Although the players are all amateurs I must say they sang beautifully. 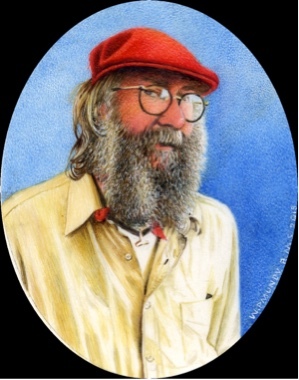 I’m busily painting miniatures at the moment - not commissions unfortunately - but new portraits to submit to the three art societies I belong to. Here’s one of them. I call it Rope Man - I saw him last year ar the Henley Boat Festival demonstrating the art of rope making. I’m getting more strength back into my legs now after the hip operation. At long last I’ve given up altogether on sticks and crutches and am walking about 4,000 steps a day. Still can’t put my socks on without the aid of “ The Sock Machine”, and my “ Picker-upper” performs a few useful functions too. We like to do jigsaw puzzles - especially in the winter. 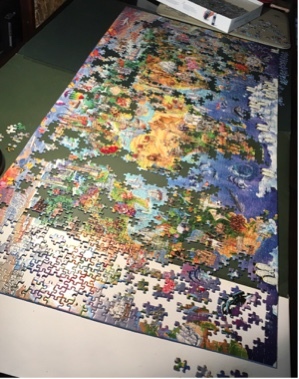 At present we are working on a big 2,000 piece puzzle showing an illustrated painting of the world. Beautifully painted it’s great fun to do. So far myf’s been doing the Asian and Australian side while I’ve been concntrating on the Americas and Europe. This is how far we’ve got. 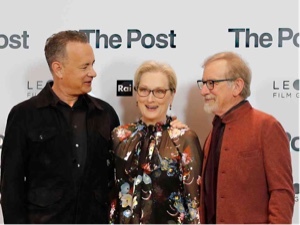 Another great film we saw last week was ‘The Post’ with Tom Hanks and Meryl Streep. It’s all about the Watergate affair and the Washington Post’s role in it. Steven Speilberg is the director and the tension throughout the film will hold you spellbound I’m sure. This is one of my favourite paintings of all time. 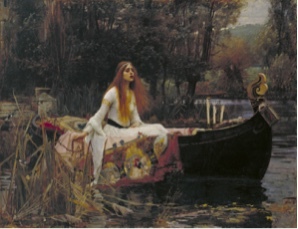 It was painted by Willuam Waterhouse - one of the Pre-Raphaelite Brotherhood artists. This is the man. 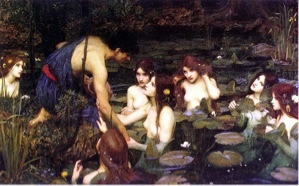 William Waterhouse has painted so many wonderful pictures, so I was really annoyed to see that the curator of the Manchester Art Gallery decided to remove the painting “Hylas and the Nymphs” from the gallery last week. It’s a beautiful painting and just because she may not like the look of naked women it seems totally arrogant of her to dictate to others in this way. Did she have complaints about the painting? No. So what is her motive? Is it a pornographic painting? Of course not. Anyway I was glad to hear that it has now been returned to its rightful place.